A hop, skip, and a jump from San Antonio is the capital of Texas, live music, and Flotrack. 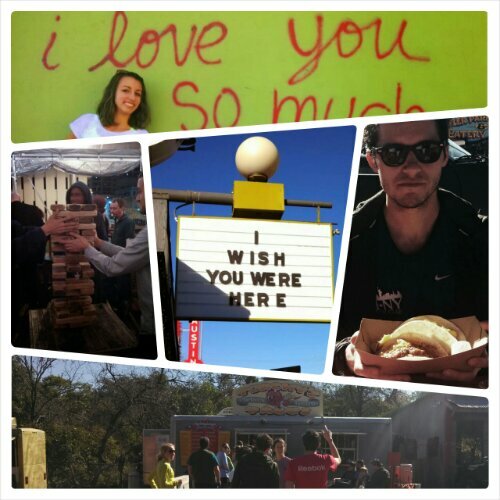 Saturday morning, we piled in the VW and took a mini road trip singing “Life is a Highway” to enjoy Austin. Thanks to the hospitality of Flotrack’s Ryan and Mitch, it was a pretty awesome trip. The day started with a long run around Town Lake, a loop that was the perfect long run distance and a soft surface. The path was pretty crowded at the start of the run, which was a little difficult for a group of six to maneuver, but it’s nice to see a city that is so fit and active. It was clear we were from out of town when we stripped down to sports bras to soak in the sun while most other people were aware that it was January and wore tights and long sleeves. After the long run, I found out that breakfast tacos are my new favorite food. Torchy’s Tacos (tag line: Damn Good) is a food truck that I highly recommend if you get the chance. Then I went to a Whole Foods that had a live band playing inside. Yes, a live band in a grocery store. Amanda, Kate, and I also had the opportunity to meet up with a fellow bird, Sarah Stevens. It was nice to spend the afternoon with Sarah and her daughter taking some pictures and checking out S. Congress Street. Austin really is a unique place. I’ve been in Texas for a week now and I feel like I’ve already gotten so much out of it. If you get the chance to escape the cold and have a change of pace in a new area, I highly recommend it. I’m definitely focused when I’m at home; I know what I’m trying to do and what it takes. But coming to a new place with the sole purpose of getting a solid month of serious, hard work in is refreshing. Getting to travel and experience new cities is an added bonus that running has given me and I’m extremely grateful to have these opportunities. More to come in the next three weeks.